Saudi Arabian Ministry of Education is seeking for the best English language textbook to be taught in schools to develop the education in the future. To choose the most beneficial one, frameworks were designed to evaluate a unit of a textbook in Saudi Arabia based on two standard criteria: frequency and learnability of vocabulary and the four strands in teaching and learning vocabulary. 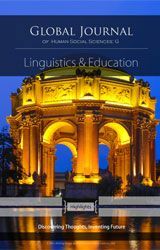 This paper is built on two important concepts: Nationâ€™s four strands through pedagogical approaches and vocabulary learnability and Lewisâ€™ theories in lexical approach and syllabus design. The results were the vocabulary is infrequent but learnable, two of the four strands have heavily activities whereas other two strands have few activities, and no consistency to recycle all vocabulary. MASHRAH, Hind. Learning and Teaching Vocabulary Acquisition: Analysing One Unit of a Textbook in the Saudi Arabian Context. Global Journal of Human-Social Science Research, [S.l. ], may 2017. ISSN 2249-460X. Available at: <https://socialscienceresearch.org/index.php/GJHSS/article/view/1990>. Date accessed: 20 apr. 2019.